It’s a monumental week in the arts community. 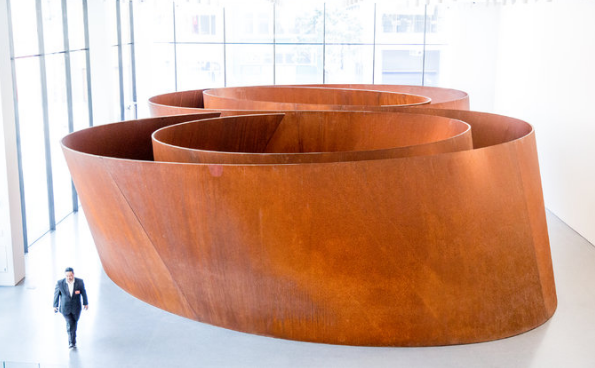 The San Francisco Museum of Modern Art, previously closed for two years while the museum underwent massive construction, renovation, and addition, has finally opened its sparkly new doors to the public. Three years and $305 million have made for a museum that is rich, beautiful, and that’s setting a new standard for art museums around the world. The newly-renovated museum includes generous donations and loans from high-powered art collectors like Thomas Weisel, who loaned a 1953 triptych by abstract painter Lee Mullican, and Donald and Doris Fisher. The museum has opened with an incredible 19 inaugural exhibitions and 1,900 works on display. There is a new exhibit dedicated entirely to photography, the first exhibit of its kind, and a gallery of photos from famed photographer Diane Arbus. There are four galleries for the work of Ellsworth Kelly alone. The museum was designed by Norwegian firm Snøhetta, and its interior does not disappoint. Included in the design are a multipurpose performance space, two restaurants, a third floor for the massive photography exhibit (that also includes a coffee bar! ), and terraces that have lovely views of sculptures. A new amphitheater looks across the likewise new Howard Street entrance. Saturday, May 14th, museum director Neal Benezra punched a button, and ten tons of red confetti was let loose from the roof of the new building. Drum corps signified the museum’s opening, and people were allowed in to see the galleries for the first time. For the time being, entrance to the museum is free, as a way to attract visitors to the museum. However, tickets are given in timed batches to keep traffic low. The $25 fee for nonmembers was waived, and all 5,000 tickets were claimed in just a few hours. Most people elected to stay in the new museum until it closed. Bob Fisher, president of the SFMOMA board of trustees, agrees. “Now we’ve got to do what we set out to do: to bring art to more people,” he said.